Sneaking in under 50 quid, does the Endura Equipe Race gilet still manage to match to excellent performance we've come to expect from Endura's Equipe range? Since becoming the official clothing supplier to the Movistar Pro Team, the Scottish brand has been going from strength to strength. They certainly continue that with the Endura Equipe Race gilet. Available in either white or black, it is easy to coordinate this gilet with existing kit. Furthermore the white is slightly transparent, meaning kit is visible underneath. Claiming to be wind and showerproof, I found the Endura Equipe Race gilet held up well in changeable weather, offering a good degree of wind protection on the chest, offering the same protection as the Rapha gilet, but at a much more competitive price. The mesh back panel provides ventilation, ensuring you don’t turn into a human Eden Project – a downfall of many similar garments. Owing to the lightness of the fabric used, there is a very small degree of flapping when descending at speed, but this really is minimal and does not detract from the product. Overall, the fit is very good, with minimal bunching on the chest and the ‘storm flap’ providing good posterior protection. As a point of reference, I am 68kgs and 6’1 wearing a medium. 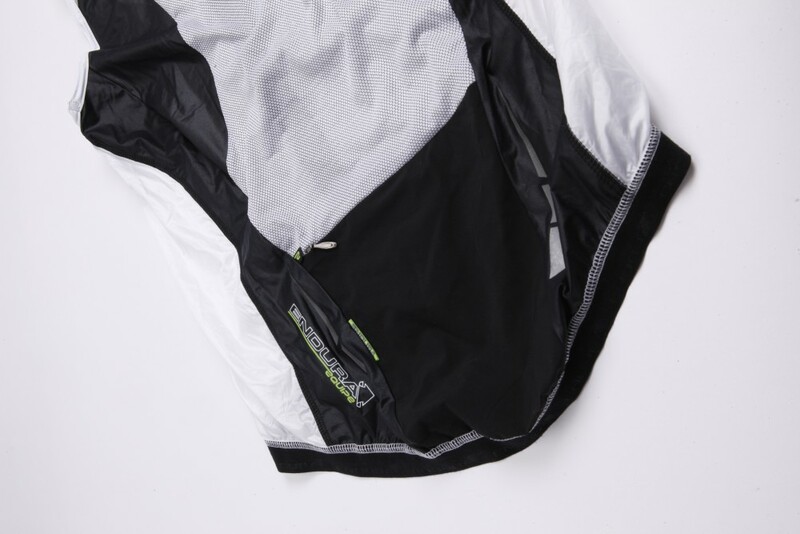 Like the similarly priced Madison Road Race gilet, a zipped rear pocket is provided for stashing some food and allows for much easier access than lifting up the rear hem to try and grab that key gel from your jersey underneath. Whilst I wouldn’t condone the use of headphones, there is port for the cable. I would happily wear the Endura Equipe Race gilet in race without fear of turning into a parachute. Packability is excellent and considering the fit, function and price, it is hard to beat. A superb option. For more details visit the Endura website. The Endura Equipe Race gilet is a superb piece of kit, packing down really small and offering protection from the wind and rain without sacrificing breathability, all without costing the earth.